I spent two days and two nights in the Hambacher Forst, an ancient forest near Cologne that has to give way to the brown coal excavators. 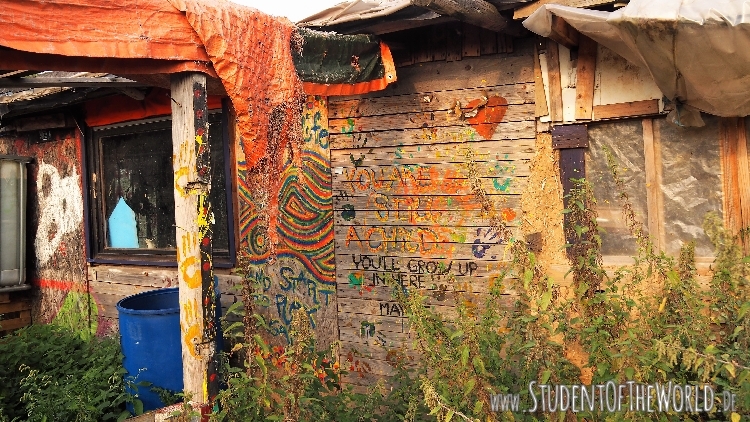 Forest occupiers have been living here since 2012. The community wants to save the small remains of the old and beautiful forest. They live in tree houses to make logging at least more difficult. At the moment, tensions rise in the forest: cutting season will start soon. The trees have to give way to the coal excavators. Every year in October or November, the power company RWE logs parts of the ancient forest. 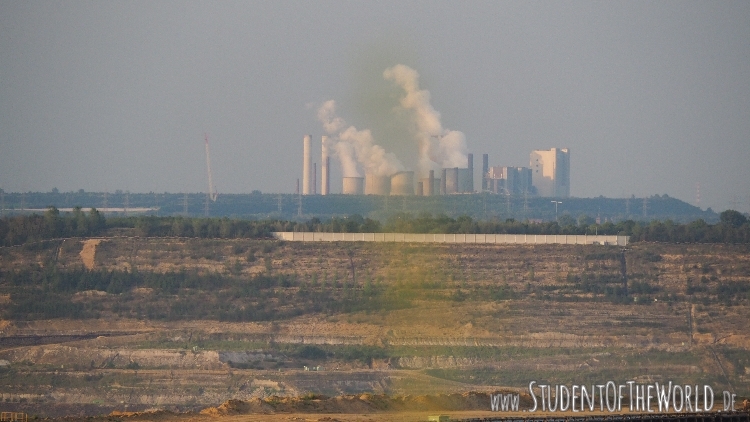 Lignite turning into energy. The technology needs tax payers’ subventions. It is not profitable. Rare combination of hornbeam, pedunculate oak and lily of the valley. 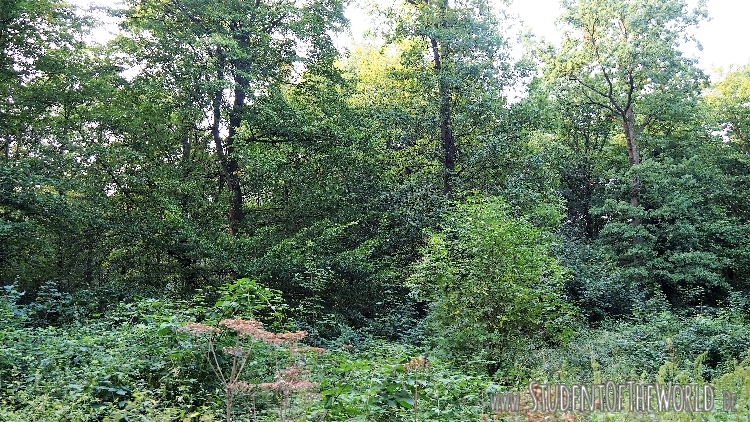 The Hambacher Forst (Bürge Wald by its traditional name) is a very beautiful with diverse old and high trees. What struck me was the sound – or rather the absence of it. I could barely hear or see any birds or other animals. What I did hear was a distant dull rattling rumbling clatter. It came from the coal conveyor belts in the open-pit lignite mine. The brim is only a five-minute walk away from the tree houses. Since the Ice Age there has always been forest at this place. According to European standards it should be protected under the Habitats Directive (Flora Fauna Habitat Richtlinie). The forest is a rare combination of lilies of the valley, pedunculate oak and hornbeam (Maiglöckchen-Stieleichen-Hainbuchenwald). Some rare animals live in it and under the habitat directive their biotope should be protected. However, in the 1970s, the government decided to give the forest to the power provider RWE Power AG to excavate brown coal. 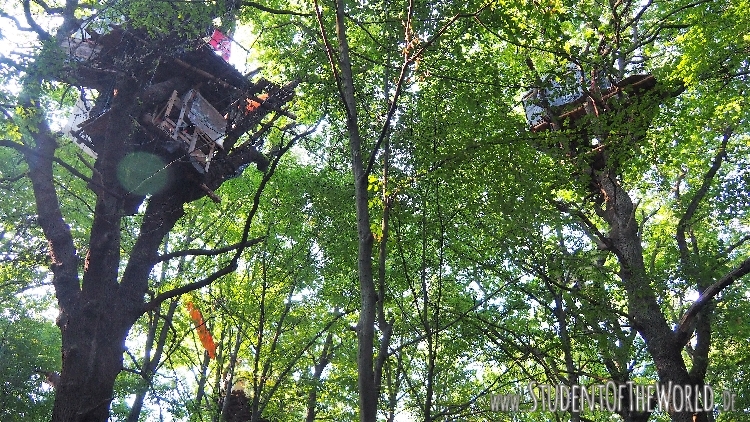 Since then RWE logged some 90% of the Hambacher Forst, as the activists estimate. Now they have electricity in the forest! 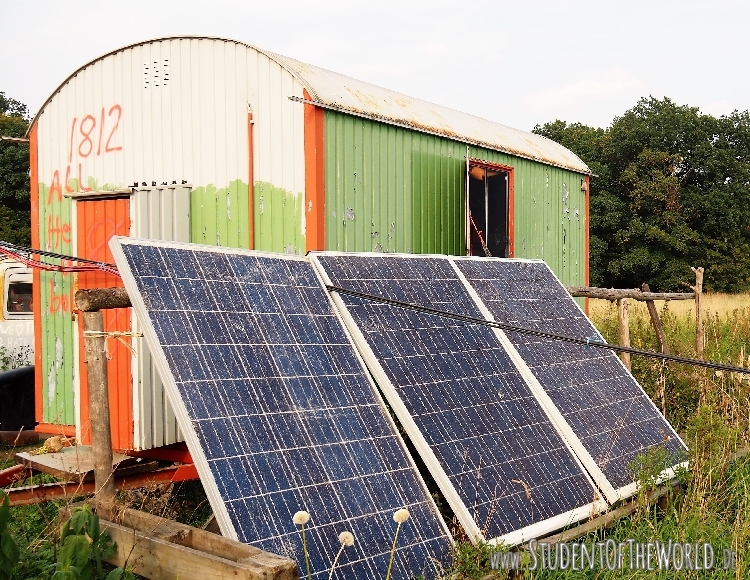 The BUND, a major German environmental NGO, tries to fight RWE on legal means. For example they bought a piece of land that is supposed to be dug away and refuse to sell it to RWE. They won a similar legal case before, but by the time of the rendition of judgement RWE had already removed the meadow. The forest occupiers are the people on the ground. They live in small tree house communities with names like Gallien, Monkey Town or Oak Town. Most of the houses are some 15-20 meters above ground. Good climbing skills are inevitable to reach them. Some guest houses are accessible by a ladder. Among the forest occupiers there are anarchists, punks, anti-fascists and other very left activists. Before I came to the forest I was not sure if they welcomed people from the outside. The media often mention the brutality of the activists. Videos and pictures in the internet prove a certain level of violence from both, the activists as well as RWE security forces and the police. The graffiti’s on campervans on a meadow outside the forest don’t exactly look inviting. 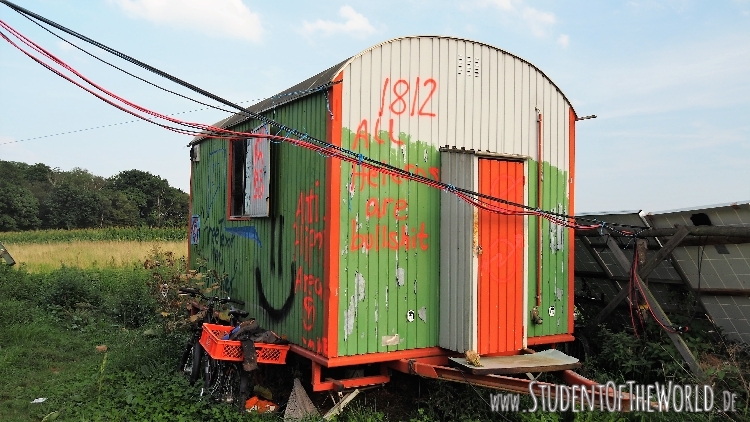 Coming to the settlements in the Hambacher Forst felt a bit like entering somebody else’s home. At first I asked where I was allowed to pee and how everything works. Then I understood that in anarchist structures it’s all about self-management with regard to the well-being of others. No rules, no hierarchy. At the same time there is this constant fear of the police and RWE’s private security forces. Paranoia is also an issue. People give themselves creative nick-names so nobody will know who they really are. An activist told me that he knows that among his “friends” there is at least one who is not a friend but a police spy. Others were worried about showing their tattoos when walking down public streets. Despite these fears I experienced the activists as extremely friendly and loving people, caring for each other and anyone who comes from the outside to support their cause. People share a lot. Many are vegans because they don’t want to harm any animals. They don’t even use firewood that could have a bug or worm inside. Life in the forest feels free. At the same time it is not easy at all. There is no water source. The ground-water level dropped due to the RWE pumps that keep the pit dry. A close-by lake dried out completely. Activists have to carry all the water that local supporters donate into the forest. It’s ten-minute walk from the road without carrying anything. However, they do log small trees to build tree houses. And this is not my only criticism of the occupiers: Sometimes I wondered what was really the purpose of their activism. If it was really for the trees I think they could do a lot more than just building tree houses. This form of activism will not change anything. The occupiers are mainly busy preparing for the big day when the police come to evict them. And yet: even today it is already totally clear how the encounter with the police will end. The police have orders and they will carry them out. They are not the right ones to discuss climate change and the importance of trees. Even if the particular police men and women who will be in the forest at that time are tree lovers they will agree with the occupiers that logging the forest is not good for climate or society. But the police are people who have, at one point in their lives, agreed to carry out orders, no matter what. So why focus all time and resources towards the combats with the police? It is the general public that needs to be reminded of what is going on. Only if many, many people put these topics back on the political and medial agendas there is hope for the forest! However, being in the forest or building tree houses there is not illegal: In Germany every forest, even privately owned ones, have to be open to the public for recreational purposes, according to the federal forest law (Bundeswaldgesetz). At the time of law-making, nobody thought about tree houses. There is no law that forbids erecting tree houses in forests for recreational or other purposes. Go For Winter Forest Walks to Protect Trees!! Walking in the forest is not illegal. In fact everybody could just legally go for a walk in the Hambacher Forst during the winter time (logging season). With hundreds of people in the forest, no tree will be killed. Although the tree houses are an important step to draw the attention of the public to the forest, they will not save the trees. The police have orders. They will clear the tree houses. It will just take a bit longer if activists lock themselves to the trees. But the result of any police combat is already clear: the activists will be carried away and the trees will be logged. Only a lot of public attention and many, many people in the forest can now make a difference and really protect the trees. So, go for your legal forest walk in the Hambacher Forst this winter! The meadow is private property of a forest supporter. RWE wants to buy it by all means and pushes for disappropriation. Only around 10 percent of the ancient forest are left. Excavator and power plants. Coal conveyor belt in the foreground. Nature’s strong will for survival! The Hambacher Forst qualifies for protection through the EU by the Flora Fauna Habitat directive, but Germany didn’t ask the EU for protection, so the forest can freely be logged. 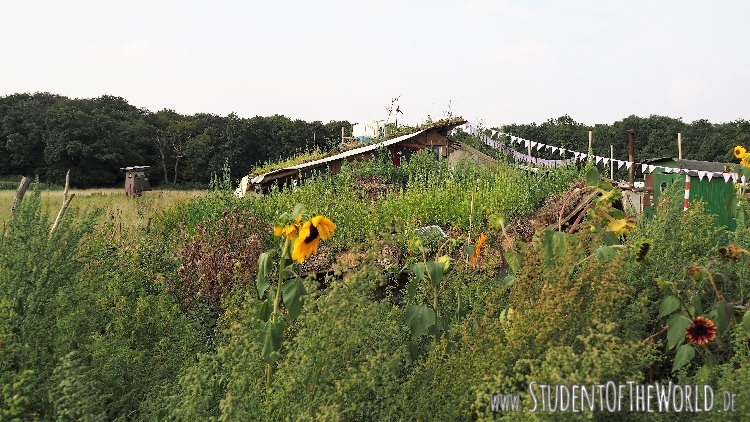 What they do in the Hambach Forest, does not stand alone. Very important is the fact that many supporters come and help, that the press is there and writes – increasingly positive – articles. The judges read newspapers too. First there were more articles on how brutal the activists are, quoted from press releases of the mining company RWE. More and more journalists are coming themselves, some of them see the brutality from the other side, specially by RWE’s security guards. All this together could be the reason why the clear cutting has been stopped now by court until dec. 31 and maybe longer. Meanwhile the regional government has to prove that the wood is not worth being protected, which they can’t. The biodiversity is very high, with many rare species. The reason is, that this wood is the rest of the continental wood that was standing here for 12,000 years, when the last Ice Age ended. By European Law, it is forbidden to damage such Natura 2000 reserves, but the regional government refused until now to apply in Brussels for this status. Meanwhile the activists do anything to delay the clear cutting. This way they could save many trees from being felled, until the judge stopped it completely, for the time being. 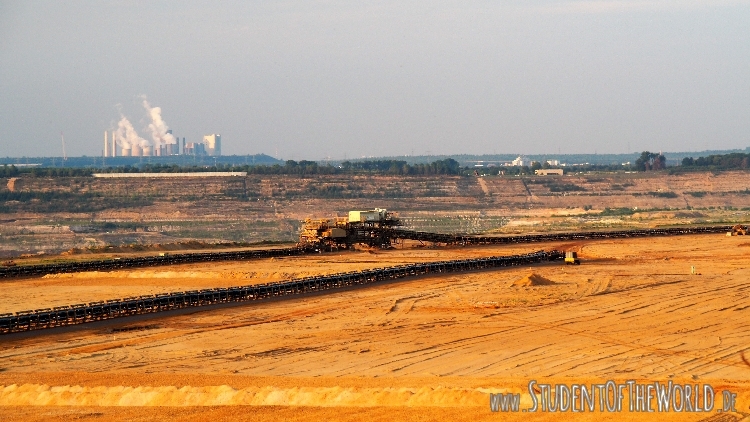 The mining of brown coal (lignite) is going to end anyway, and RWE as well.